I recently joined an obscure group on Facebook called, D&D 5e Character Optimization, its an interesting group which seems to spend most of the time sharing ideas of how to build one type of character or another. It got me thinking though. If I wanted the most optimal character build in D&D 5e…what would it be? I’m certain there have been thousands, even tens of thousands, of discussions and debates around gaming tables and message boards, and plenty within the Character Optimization group – but I’m not interested in conjecture, or theories, or opinions…I want to know for a fact! Given I’m a professional programmer and hold a PhD in data analytics, I thought, certainly there must be a way for science and technology to help me get to the bottom of this all important matter. So with some spare time on my hands, I did what any responsible adult and D&D player would do. I spent an unreasonable amount of time, creating a D&D 5e combat simulation environment, randomly generated 5000 characters, from one of four classes: Cleric, Fighter, Rogue, Wizard, and simulated about 6 million battles – 5,920,374 to be exact. Here are the results. Alright so there are some meaningful simulation characteristics I should describe to begin with, to help set the stage. Admittedly, the simulation isn’t perfect but it’s pretty decent I think, allow me to explain. Actually simulating all of D&D is pretty impossible and borderline equivalent to the matrix. As cool as that sounds, it is slightly outside of the scope of what my wife, financials and limited brain power would permit. D&D is a completely open world, where characters evolve based on where the adventures takes the adventurers, the personality of the DM, different house rules, a nearly limitless number of factors. So clearly I didn’t recreate all of that. Here is what I did do. Five thousand characters are randomly generated. They roll their stats, six rolls of 3d6, they get what they get, in that order. Each level they roll for Hp, level one they start with max hp as I aimed to follow all the basic rules as written on the Wizards Basic Rules of D&D page. Since those rules are free, and cover the base four classes, I only use those classes; in part to avoid any legal trouble and to also avoid enabling a way for people to not have to buy the player’s handbook. Since those rules are freely available, I suspect I won’t cause any trouble. The characters’ gear is also from the basic rules, and for every 4 levels, the character has a chance at receiving a magical item – plus AC for armor or plus hit and damage to weapons. Their items include four pieces: armor, shield, ranged-weapon and melee-weapon. The magic component is a 20% chance at +x, where x is equal to the character’s level divided by four. So, a level 20 could have a +5 shield, armor, sword, or crossbow. If the level 20 character misses out on the +5, they have a 20% chance at a +4, and so on and so forth, till it’s +0 i.e. non-magical. Level three and below don’t have any magical items since 3/4 is less than 1. Level 5 for example could have a +1 on something. The chance at a magic item is “rolled” for each of the four items. So a level 5 for example, could have a +1 on all four items. The combat is pretty simple. Essentially I tried to re-create an MMA style cage fight. Two combatants enter, one leaves. Characters start 100 feet from one another. With a 5000×5000 matrix of characters, all characters fight all other characters, so long as their level is +/- 5 of each other. So a level 20 never fights a level 1. Side note: even after roughly 100 million simulated fights during debugging, etc. a level 1 never beat a 20. A level 15 will fight a level 20 though. A level 1 will fight a level 5. Next, I record the outcome and some other various statistics. There are a couple more caveats. Just having all out brawl had the expected bad results – fighters, unsurprisingly win. Simply brawling does not properly take into account the class traits. So, wizards need to cast, and so do clerics. Also rogues need their sneak attack. So, wizards and clerics only have their attack spells prepped and every fight is a new day with all spells ready to go. Does this mean the level 20 wizard can always open with Finger of Death? Yes. Does he? Yes. Does he almost always win? Yes. Next, rogues need sneak attack. So, if rogues win the initiative, their first attack is the sneak attack – interestingly sneak attack even works with ranged, see the rule book if you don’t believe me. Last, fighters claim to fame is their number of attacks, so they attack a lot. The AI for the characters is pretty rudimentary. If they have ranged attack, they attack with range and move half distance towards each other. If they’re out of ranged attack, i.e. spells or their 20 ammo, they march full move ahead. If they are within melee, they melee. Alright, I know the simulation is not perfect, but I don’t get paid for this, so what do you want? I do have life outside of simulating the rules the of D&D 5e, so it is what it is. Nevertheless it is pretty interesting and kind of funny – so I will be putting the code up on Github and if others are so inclined to improve the AI, or incorporate more characteristics of D&D into the simulation, I would be excited to receive the support and would be happy to merge pull requests. The simulation is written in C++ and is single threaded. It takes about 10 seconds to run 6 million fights. Afterwards, I write the combat outcome to a json file and read that in to a python script to do some analysis. Here is what I found. Alright, we’ve got a 5000 character slug fest, what are the results?! Clerics for the win! Here is a graph broken down by level and class, and their percent chance to win a match plotted along the Y-axis. Once Clerics reach level 5, they simply become murder machines. Investigating further, I looked at the correlation between, all the character statistics I have: stats, AC, Hp, etc. 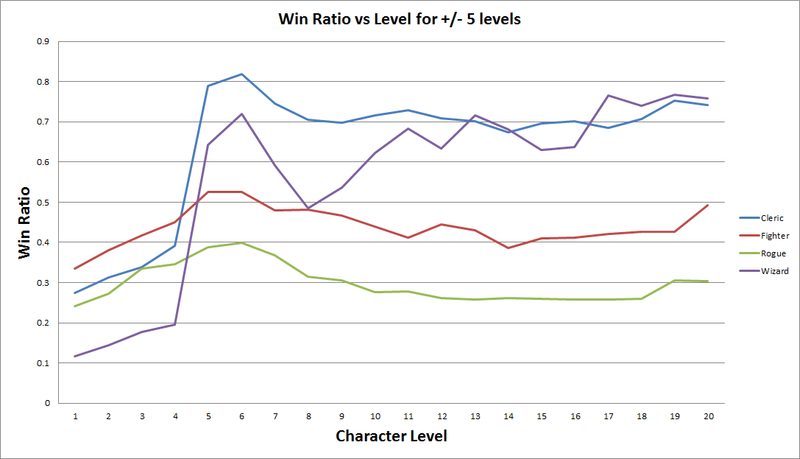 most traits have nearly zero correlation with win ratio. Ammo interestingly has a negative correlation, -0.210987, which suggests not shooting enough is bad. It’s also interesting that constitution seems to play a larger role than Hp and Level, so when you’re building your optimal build, maybe make sure your constitution is your highest stat. For the other stats, Int, Wis, Dex, everything else, they all had correlation values below 3%. There is plenty that could be done. I don’t have races. Races seem primarily to add stat bonuses, but considering the exceptionally low correlation between stats and winning, whatever bonuses one might get to Dex from being an elf seems likely irrelevant. I don’t have all the skills, this is something which I would like to address in time. The AI is arguably too simplistic – Clerics don’t heal…but I guess they’re too busy killing everyone. It could be exciting and fun to train different AI’s and pit them against an A*, and calculate the importance of the AI in regards to win ratio. Then find the highest winning AI, and dissect its combat technique. From the technical perspective, I should multi-thread the simulation, and at least use all eight cores my PC has available. Going a step further, it would be even cooler – and in fact doable – to run the simulation on the GPU using CUDA. 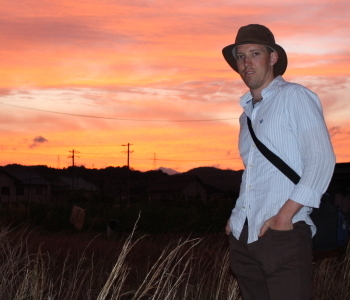 Last, using json as the output file format is inefficient, so I would like to change to a more efficient format. Currently, six million battles is nearly two gigabytes of data. I think it would also be interesting to incorporate teams, and using the four stats above look at machine learning for predicting fight outcomes. In any case for now, I hope you enjoyed the read and happy role playing.